Contest! 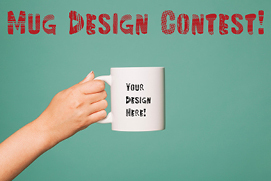 UT Students, Submit Your Mug Design for a Chance to Win! BESIDES THE FOUNDING OF THE UT HISTORY DEPARTMENT, THAT IS! On Saturday, November 10, 2018, the History Department will host a day-long celebration of our 130th Anniversary. We would like to provide distinguished guests with a commemorative mug designed by a UT History major. Submit your design for the Department of History artist mug! The History Department seeks submissions from our talented and creative students for the History Department’s 130th Anniversary Mug Design Contest. The winning design will be featured on a limited-edition mug that will be available to History guests and donors during the 130th Anniversary celebrations this fall. What does History mean to you? What image conveys your love of history? Your design should reflect an appreciation of the UT History Department. We welcome all styles of artwork from cartoons to watercolors to photographs – as long as the design translates well on a mug! The winner will be featured on our website and also will be promoted during our celebrations this fall. The winning artist will receive a YETI Texas Longhorn Rambler Tumbler, and a NIKE Texas Longhorns Team Backpack. All entries must be received by the department by 5:00 p.m. on Monday, September 24. Please upload your file to the Student Submission section of the History Contact page. More than one entry per artist will be accepted. Please do not send large files via email. The printing space is 2.25” W x 3.5” H. two sides or optional 8.25”W x 3.5” H (Wrap). It must fit into this template. The image should be in full color and designed so that it wraps around an 11-oz. white ceramic coffee mug almost from handle to handle (see sample images, above). The design must be provided in a digital format. We accept Adobe Illustrator (highly preferred), Photoshop, Corel Draw X3, JPEG and TIFF 300 dpi or higher. Hi-res vector art in CMYK is ideal. The artwork can be created in any medium you want, even a painting or quilt, but it will need to be scanned or photographed at a high resolution to be converted into a digital format and fit the same printing space given above. The caption “designed for UT History Department by (your name) 2018" must be included. It can run along an edge of the artwork (within the printing space) or be incorporated into the design. The design must be created exclusively for the UT Department of History. The artist gives UT the unlimited rights to reproduce and/or display the image on mugs, our website, and any other promotional materials. The image will become the property of UT, and as such, UT has the right to request native files from the designer and may edit the design as necessary for UT’s needs. UT will retain the original art for the University’s permanent collection. The artist will not receive cash payment for the work. The voting committee comprises History faculty and staff; however, the History Department Chair reserves the right to select the winning design. Questions? Please contact Martha Gonzalez at mggonzalez@austin.utexas.edu.